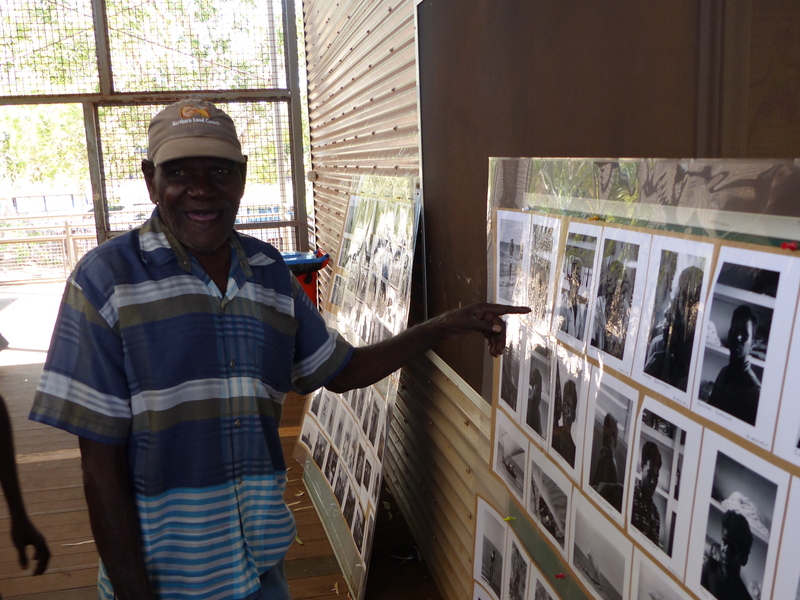 The Returning Photos team recently returned from a successful trip to the KALACC 2017 Kimberley Cultural Festival held at Lombadina, north of Broome. 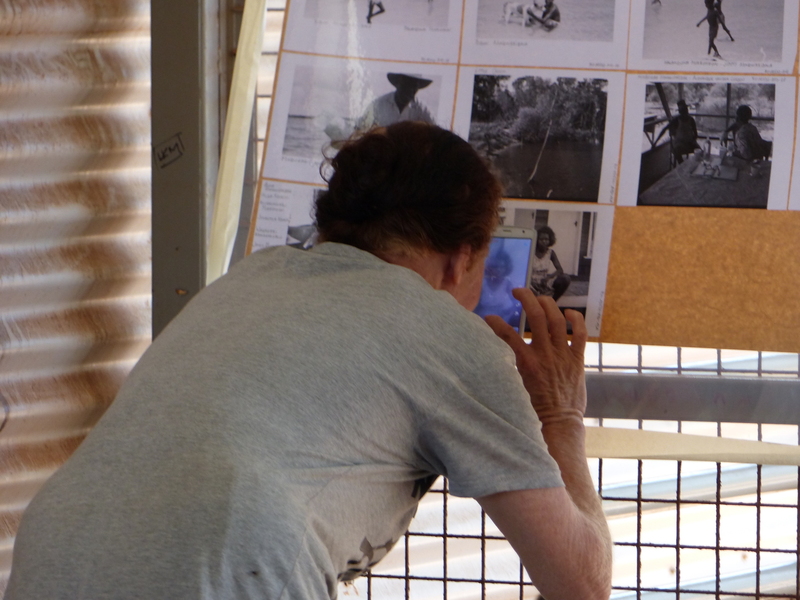 After working closely with the Kimberley Aboriginal Law and Cultural Centre staff for well over a year prior to the Festival, our team were able to return photographs to community members during the three day event as well as inform people about our project. As part of the event, we were grateful for the additional inclusion of photographic collections from the Berndt Museum at the University of Western Australia who hold one of the largest Aboriginal photographic archives in Australia. We are grateful to the staff and Board Members of KALACC – in particular Mr. Tom Lawford, the Berndt Museum and of course our overseas partners who helped facilitate this project. Also many thanks to Community members who were able to add information and names to previously unidentified people. The National Museum of World Cultures in the Netherlands (an umbrella organisation located in Amsterdam, Leiden, Rotterdam and Berg en Dal) holds some 500 photographs made by the Dutch anthropologist Alexander van der Leeden during his one-year fieldwork research in Numbulwar in 1963-1964. The photographs give a snapshot of life in a settlement on the eastern coast of Arnhem some ten years after it had been founded. Indeed Numbulwar, or Rose River Mission by its original name, was established as a mission post in 1952 by the Church Missionary Society (CMS). The main goal was to provide the nomadic Nunggubuyu population with a settlement of their own. 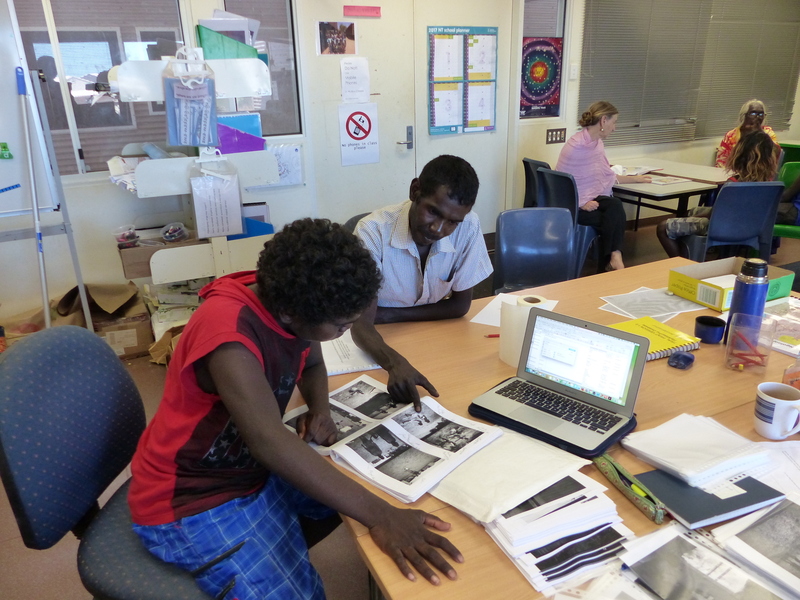 Paul Numamurdirdi and Hilda Ngalmi identifying people in the photographs. The first step was checking the identification of people in the photographs and the spelling of their names. This work was done in collaboration with a few elders – both men and women – who could also advise on men’s ceremonial images. An excel spread sheet now compiles the photo number with the names of people and place appearing in the photograph. The naming of people is especially important for the younger generations who might not know what their grandfathers and mothers look like, but do know their names. 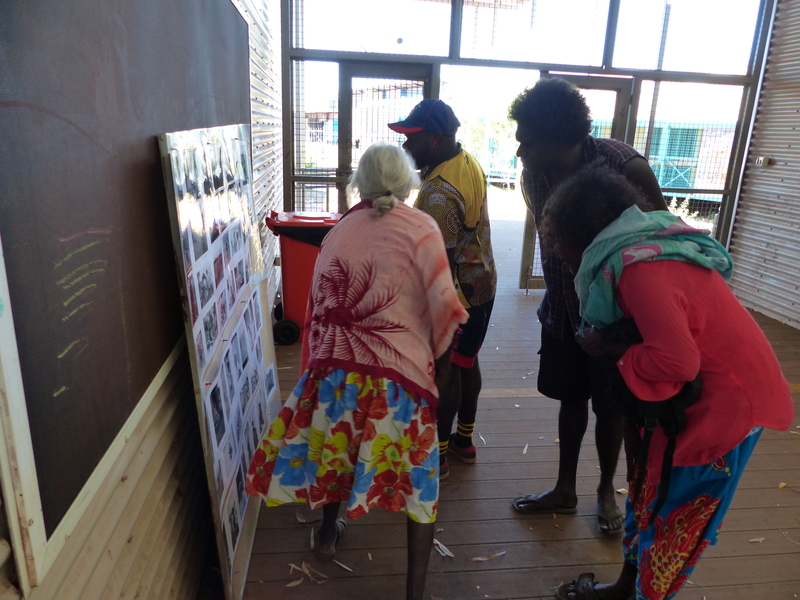 Even though some of the people in the images had recently passed away, the elders felt it important that I noted down their correct names as they realised this information would then be handed down to their children and grandchildren. Thus, when culture can be kept alive, a pragmatic approach was adopted towards cultural protocols and guidelines. My workplace was the Wubuy language room in the Numbulwar school. While in the 1960s Wubuy was the main language of the inhabitants, today Kriol, a creolised language based on English, is the mother tongue for most children. However, Numbulwar has today an active programme of teaching Wubuy from preschool children to young adolescents. 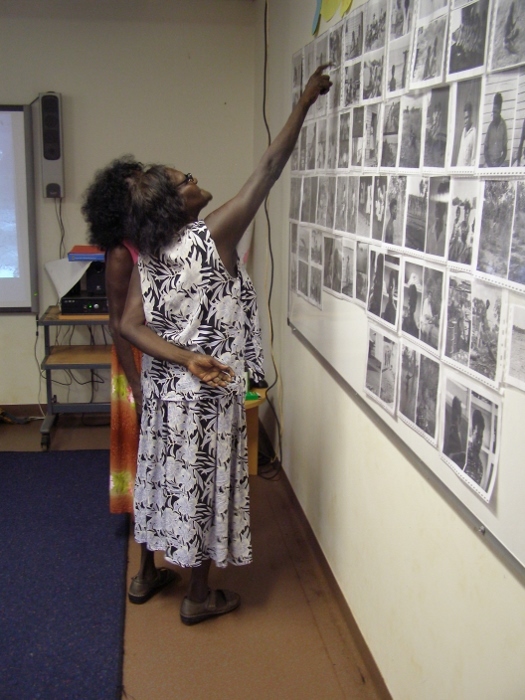 Together with the teacher linguists Jangu Nundhirribala, Hilda Ngalmi, and Helen Flanders we decided to paste the photographs, which I had printed on A5 formats, on large sheets of brown paper that were subsequently laminated. 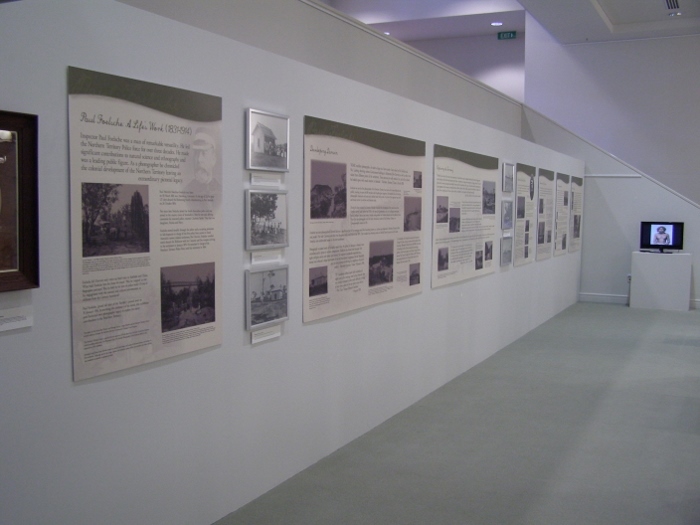 The 170 photographs on display had all the names of each individual person appearing in the photograph. The laminated sheets were put up just outside of the Wubuy classroom and outside of the Numbalwar shop. 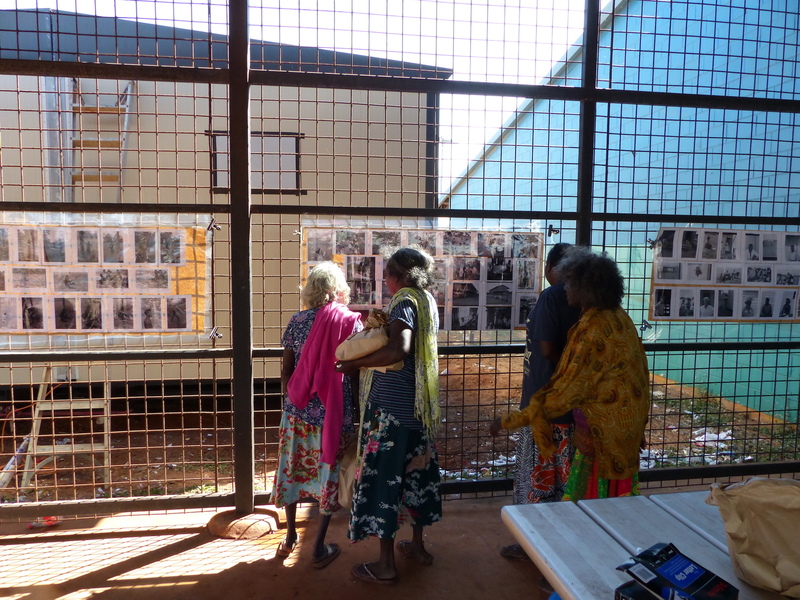 People enjoying the exhibition at Numbulwar school. People came in large groups or by themselves. The display appeared to be an intergenerational affair with children, young adults with their toddlers and elders attending. Some people came back several times or brought family members to come and see the exhibition. It allowed for everyone to reaffirm his or her kinship links. Most people spent at least half an hour in the exhibition. People looking at the exhibition at the Numbulwar shop. The versatility of the laminated rolls means that the exhibition will be easily set up at the Numbulwar Festival held in September 2017. Dan Bara explaining kinship relations to a school boy. Paul Numamurdirdi wants to show the ceremonial images to boys in preparation for their circumcision ceremony that is planned around Christmas time this year. 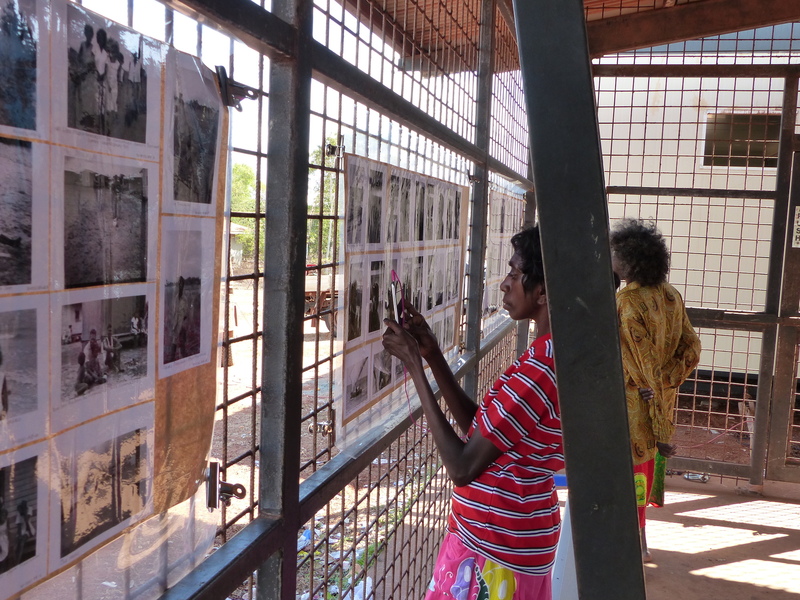 Several people in the community saw the photographs also as an important teaching tool. 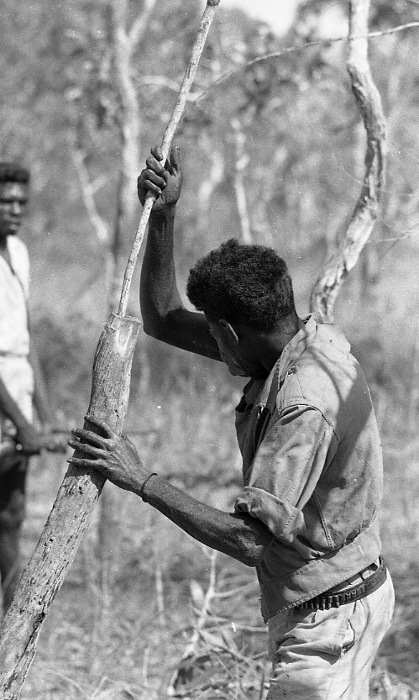 Photographs, which paid attention to didgeridoo making, or dugong fishing were popular. However, non-motorised canoes with sails attracted great interest. Some of the school children tried to play truant telling the teachers linguists that they needed a little bit more time to look at the images before going to their Wubuy class. Many people in the community have smart phones that they used to take pictures of single images. Moreover, the images are available on the school computers. 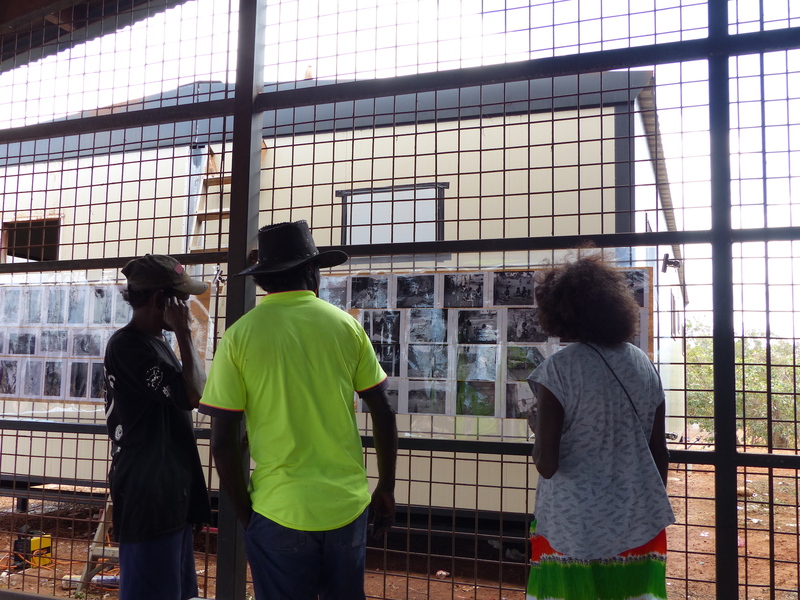 Community members are actively looking for possibilities of granting access to these digital images in the newly built small arts centre. Despite all these digital access possibilities, the exhibition visitors appreciated the presence of physical prints making material engagement possible, touching and pointing at the images. 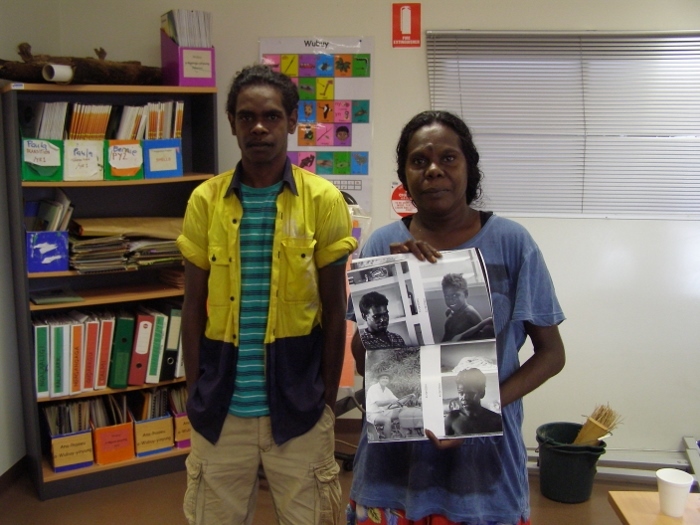 Moreover the community members appreciated being able to get hard copy images featuring their family members, which were printed at the Numbulwar school. The sharing of images with Numbulwar community members showed the importance of having the actual images in the community while providing back-up access in digital format as well. I am grateful to the Numbulwar school staff and all people connected to the school. 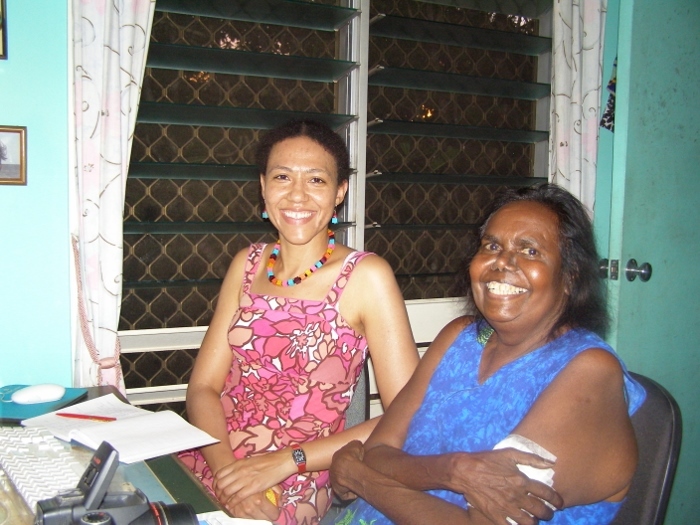 Helen Flanders, Hilda Ngalmi, Dan Bara, Jangu Nundhirribala (in addition she took me fishing and catching crabs, and showed how to cook dugong), Paul Numamurdirdi and Anthony Gray have been particularly helpful in the process of naming people and facilitating the exhibition process. 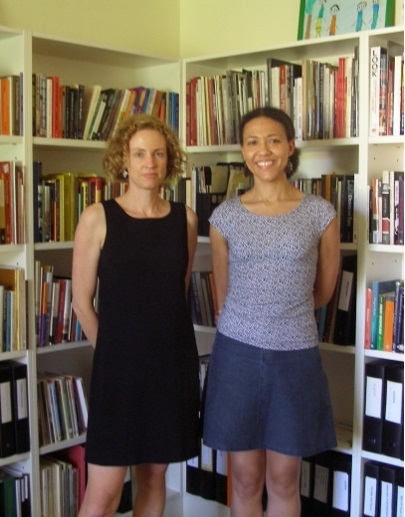 I am also indebted to Jane Lydon and Donna Oxenham at UWA for their intellectual generosity and allowing me to be part of the ARC funded project “Globalisation, photography, and race: the circulation and return of Aboriginal photographs in Europe”. Victoria Burbank with her decades of research experience in Numbulwar facilitated my initial steps in the community by suggesting people I could speak to. Last but not least, I want to thank the people of Numbulwar who welcomed the photographs (and me) with such an enthusiasm that once again proves the significance and relevance of sharing museums’ photographic archives with the community. 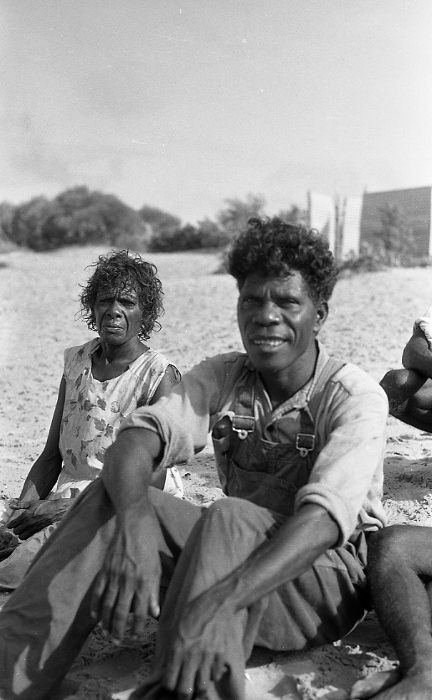 At the turn of the twentieth century, we can see from our photographic archives that Aboriginal peoples in Western Australia were in varying stages of transition from their traditional lifestyles into a more regulated westernised existence. As with all archival collections, it is through these surviving images that we begin to understand what life may have been like for those that came before us and the hardships they had to endure to survive in a fast changing world. As confronting as many of these images can be, it is always important for us as viewers to remember to look past the origins (the purpose of which the photograph was taken) of an image to really “see” the person within it and remember that they were someone’s mother, brother, sister or father. As an Indigenous person working with these archives, I often wondered about the person behind the camera and what motivated them to take such photographs in the first place. 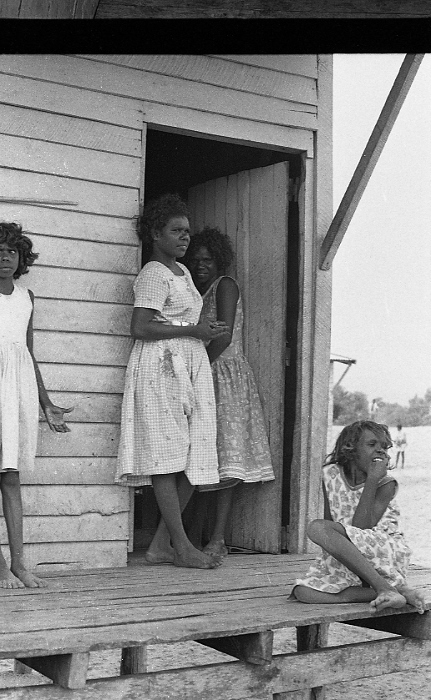 Whether it was taken for scientific purposes, governmental propaganda or personal curiosity – many of these images – often staged – depict a time and space that categorized Aboriginal peoples as objects and research subjects. One small collection of images in particular that I have been working with recently originated from the Western Australian Museum founded in 1891 but for reasons unknown were copied to the Cambridge Museum’s collections. As with many archival records from this time period, there is a limited amount of data that can be found with these records. However, we are almost certain that the photographer behind these images was John Thomas Tunney (1870-1929). Tunney was employed by the Western Australian Museum from 1895-1906 and was responsible for adding to the Museum’s natural history collections. 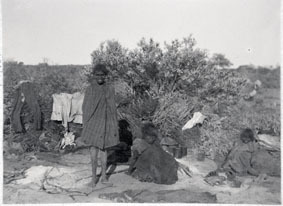 As part of his employment, he was required to photograph Indigenous peoples in ‘their natural state’ and collect their cultural materials/objects where possible. Throughout his fieldwork Tunney travelled broadly across Western Australia. 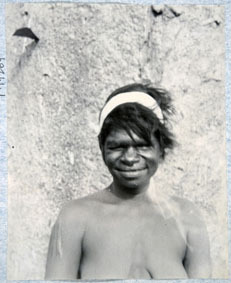 You can see that the majority of his photographs are more scientific in nature, however there are the occasional group images that portray Aboriginal people more informally and in a less staged manner.What Tunney’s images highlight is the fact that even though his photographs were taken here in Australia over a century ago, the fact that they -like the rest of our collections- have found a place within an Institution overseas underscores just how much interest European countries had regarding us as a people and culture. Whether it originally stemmed from a research curiosity or a genuine interest to know more about our people, without their involvement we may never have had this opportunity to give back to families’ and communities’ images of their ancestors. 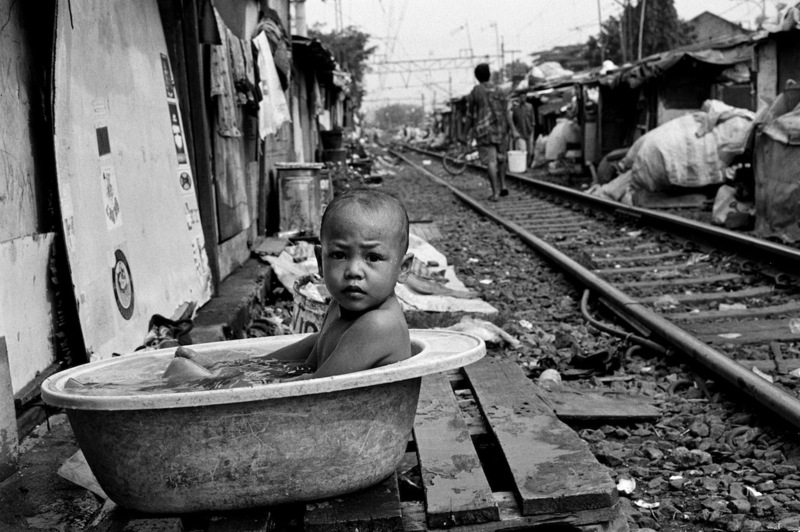 Photo: David Dare Parker – Senen, one of Jakarta’s poorest areas. Here people live in illegally erected shacks precariously near fast moving trains. We are pleased to announce that the Returning Photos team will be convening the “Visualising Human Rights” conference to be held in December 2016 in Fremantle, Western Australia. This event explores the powerful role of photography in shaping our understanding of human rights. Historically images have been a crucial way of disseminating ideas, creating a sense of proximity between peoples across the globe, and notions of a shared humanity. In recent years scholars have begun to argue for new notions of photography that turn our attention to our responsibilities as viewers. A new interest in the medium’s social effects has displaced analysis of the photo as sign and the photographer as author, and raises compelling questions regarding affect and representation, the limits of empathy across racial, gender and class lines, and the complexity of understanding images of distant suffering. How do these insights help us to understand our own situation, and the varying forces of modern imagery? This conference seeks to explore these and other questions surrounding the historical reception of human rights via imagery and its legacies in the present. 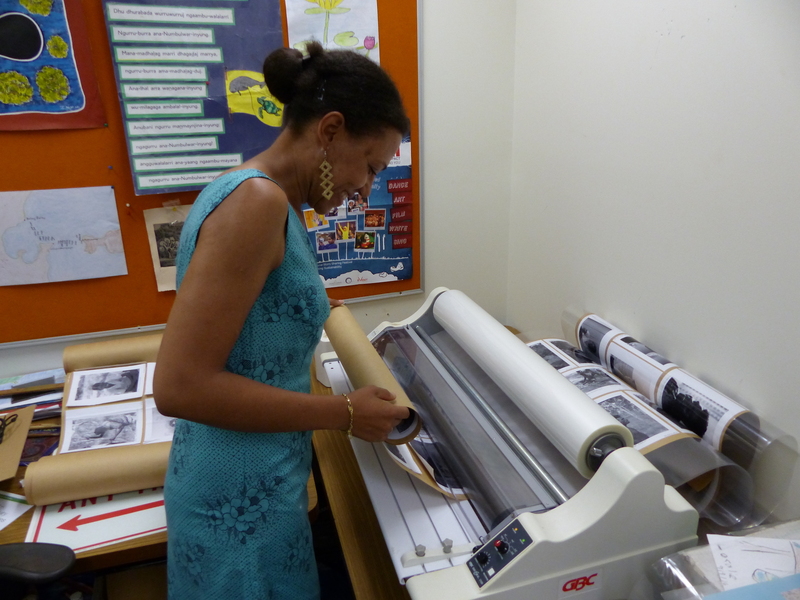 Wonu Veys travelled to Australia as part of an international collaborative project entitled Globalization, Photography, and Race: The Circulation and Return of Aboriginal Photographs in Europe. She has worked extensively with the photographic collections found within the Musée du quai Branly, but more specifically with pictures from the Museum of Ethnology. The following is a blog account of Wonu’s travels that have been translated from Dutch to English. House of a man who passed away recently. The house has a brown-red line to indicate that it has been cleansed by a smoking ritual. 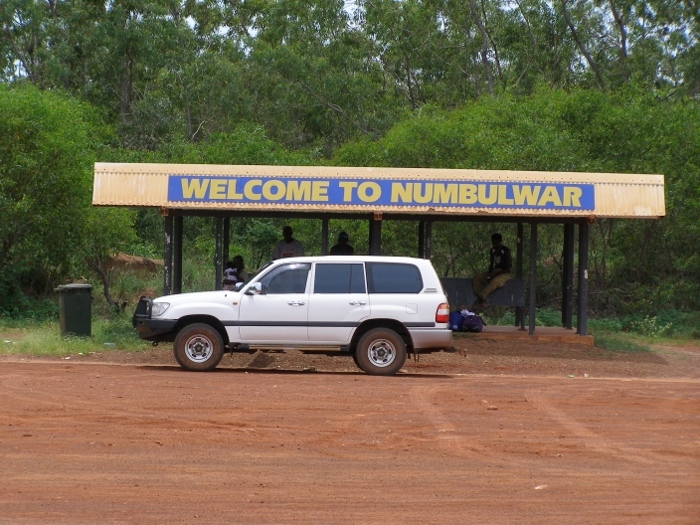 Numbulwar is very quiet today. Sunday is the day of leisure for the locals, whether it be a picnic on the beach or fishing with the family. The men in the community specialize in spearfishing. The morning is not filled with the sounds of singing from the church as many residents prefer to practice their beliefs in their own way when is comes to their Christian faith and religious beliefs. During my time spent in the community I often heard of those that had been affected by curses, which could only be lifted by a ‘smoking ceremony’. Community members took this very seriously. Sunday in Numbulwar: family picnic and fishing. Today is my last day in Numbulwar. I say goodbye to the women who have helped me so much and will be taken to the small airport, which is extremely busy today. 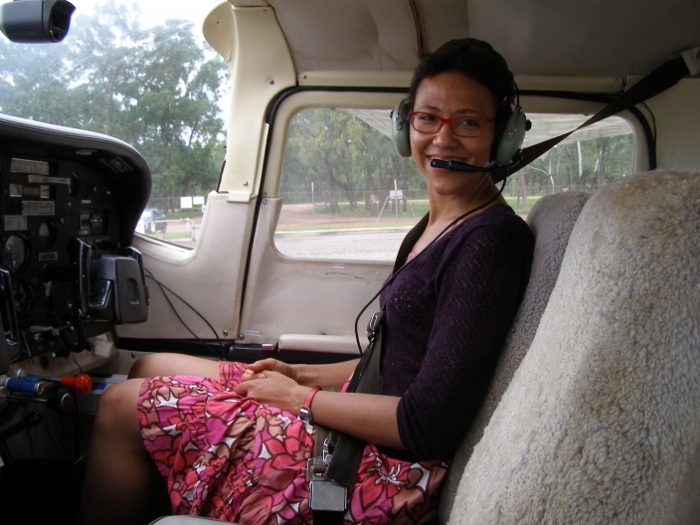 My one-engine plane brings me to Gove Nhulunbuy or a settlement made rich by the bauxite mines. From here I drive about 17km from the airport with a two-wheel drive vehicle to Yirrkala. Yirrkala lies in the heartland of the Yolgnu people, who played a crucial role since the 1960s in the struggle for Aboriginal land rights. Yirrkala is also an artistic epicenter. Hundreds of woodcarvings bark paintings; basket weaving and prints are offered for sale at art centers. Artists travel from afar to sell their works at the center. While I was there I met a man who had brought in a bark painting of a yam plant. He told me that his wife had made it, and that he had brought it in to sell. 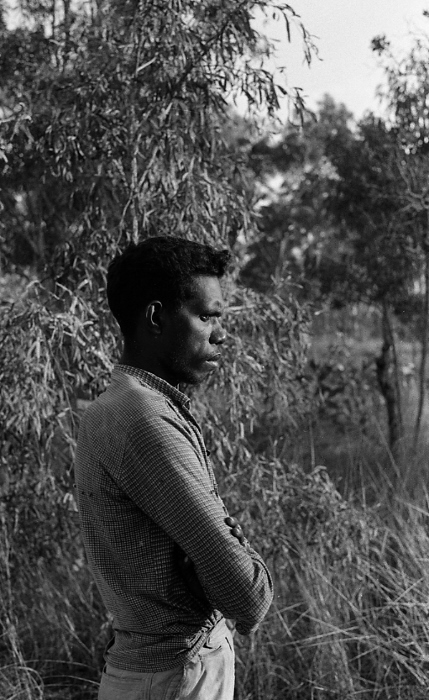 When I asked if he was from the area, he replied yes, he lived at an outstation only three hours drive from Yirrkala. He claimed that he could even make the journey during the rainy season, although occasionally you may have to drive slower. Artists can also create their artworks in the center itself; the best works are exhibited in the museum. In the performing arts, the Yolgnu people are very talented. For example, the Yolngu musician Geoffrey Gurrumul Yunupingu continues to entertain thousands of fans both within Australia and abroad with his ability to sing in both his traditional language and English. 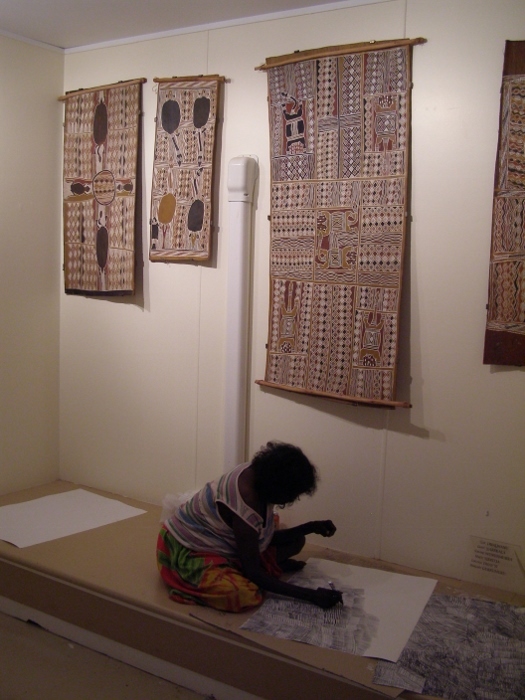 Ms. Wununmurra from Gurrumuru working on an artwork. She belongs to the Dhalwanu clan, the Narrkala group and the Yirritja-moiety. 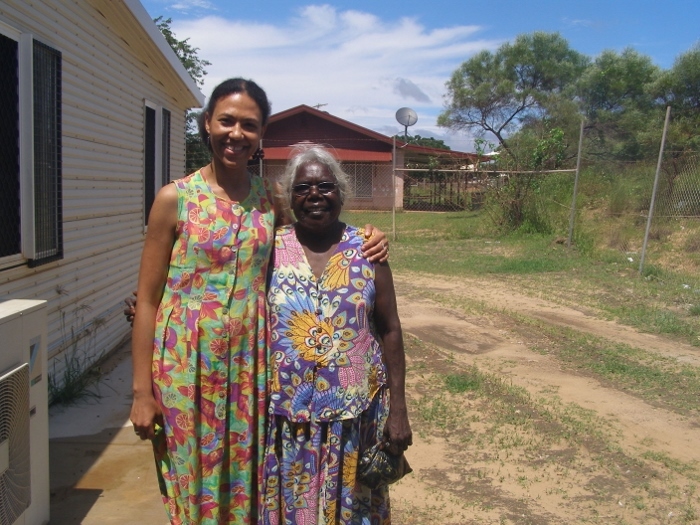 Yirrkala is also home to ‘ The Mulka Project, which is a project that aims to protect and to help continue the cultural knowledge of the Yolgnu people. The organisation focuses upon the Yolgnu law, culture and governance with an aim to build an archive and make contemporary films. Young people participate actively. 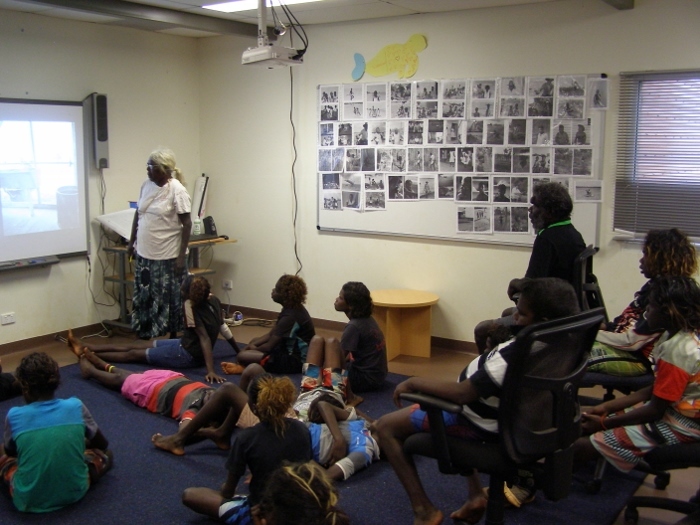 During my stay in Yirrkala, young people were constantly coming in and out to practice their new choreography, which are often based on information found within old film stock, which had been stored with the Mulka Project. The Mulka Project also provides computers so that community members can have access to the archives. One of these computers is connected to a small theater. As a result, I was able to watch a short film entitled, ‘Bayini’. Bayini tells the story of a group of young people who do not listen to the warnings of an older man and still go to an island inhabited by a ghost. At important ceremonies community elders can contact the Mulka project to help assist in filming the events. The day started with an impressive tropical rainstorm. Miraculously, by the time I was meant to fly by charter plane to Groote Eylandt there was almost no cloud to be seen on the horizon. 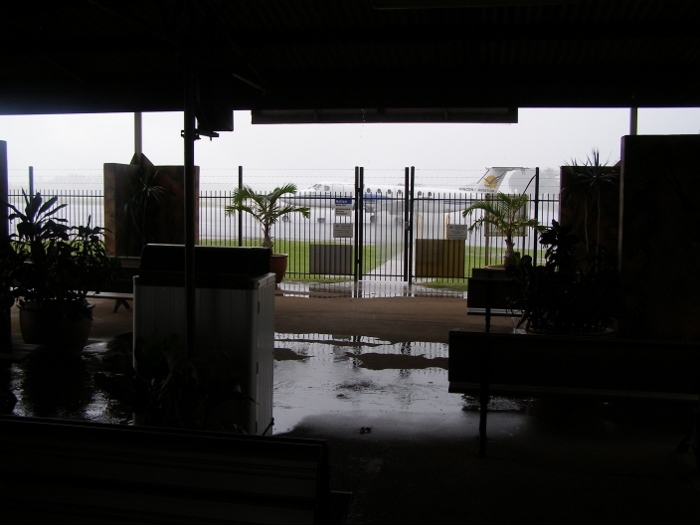 On arriving however, it rained so hard that my scheduled flight to Darwin had to be delayed by four hours. So I had ample time to explore the airport. 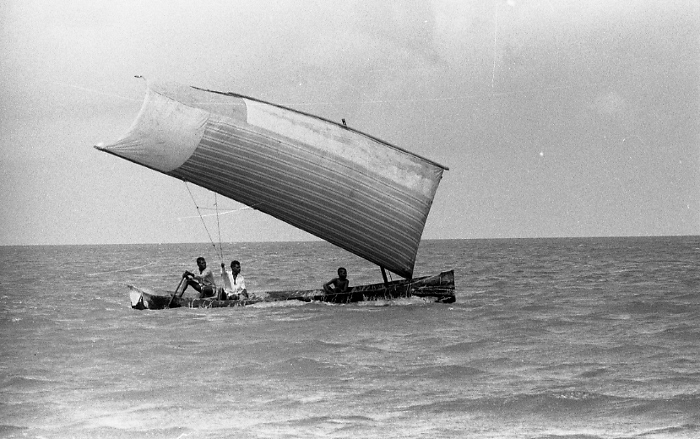 As the name suggests, it is the Dutch who named Groote Eylandt in 1644 when Abel Tasman named the largest island in the Gulf of Carpentaria. 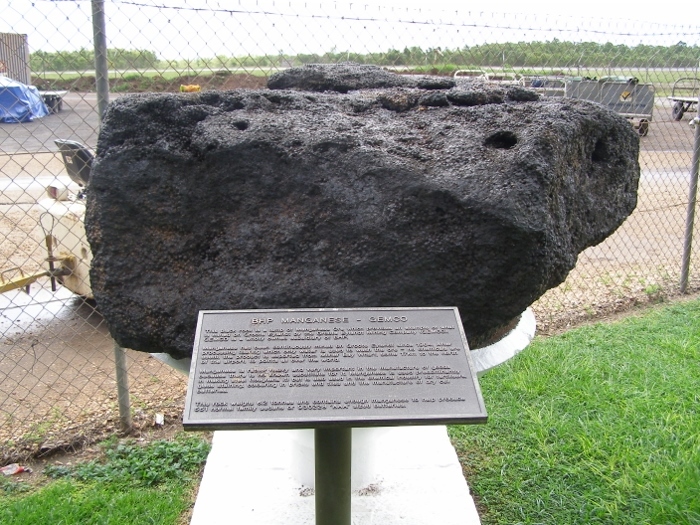 Since the 1960s, Groote Eylandt has provided about a quarter of the worlds manganese supplies annually. 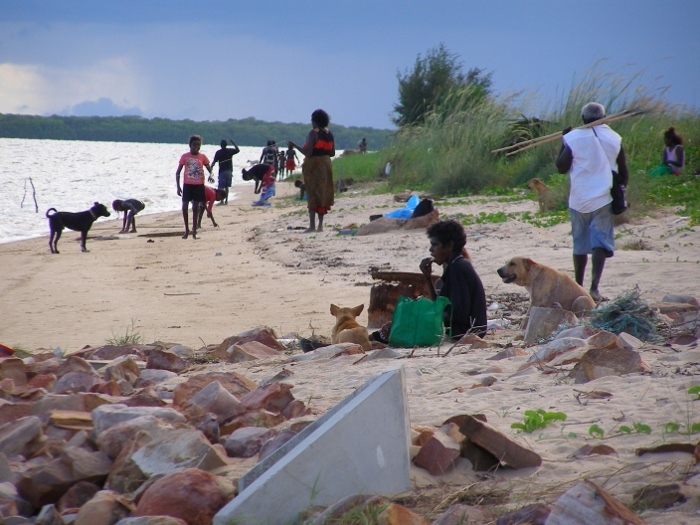 The traditional owners of the island is the Warnindhilyagwa people whose language is probably very similar to the Wubuy spoken by Nunggubuyu from Numbulwar and their surrounding regions. It is certain that both groups share many rituals and family relationships. 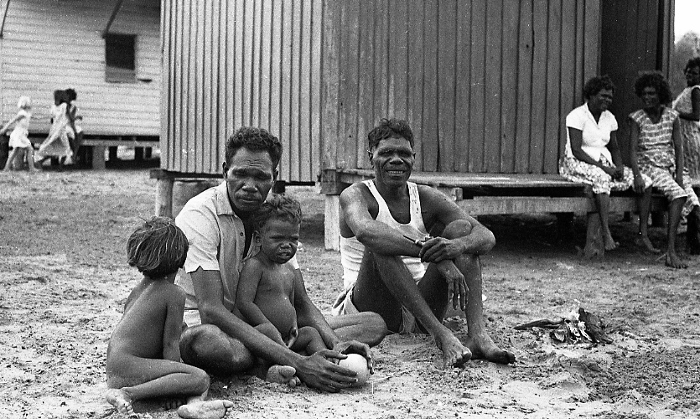 Groote Eylandt had centuries of contact with the Macassan traders from South Sulawesi each year to the shores of Arnhem Land looking for pearls and sea cucumber (trepang). Eventually the five passengers (including myself) who were scheduled to fly to Darwin boarded the plane after slogging through five centimeters of water. The flight itself went without any problem. 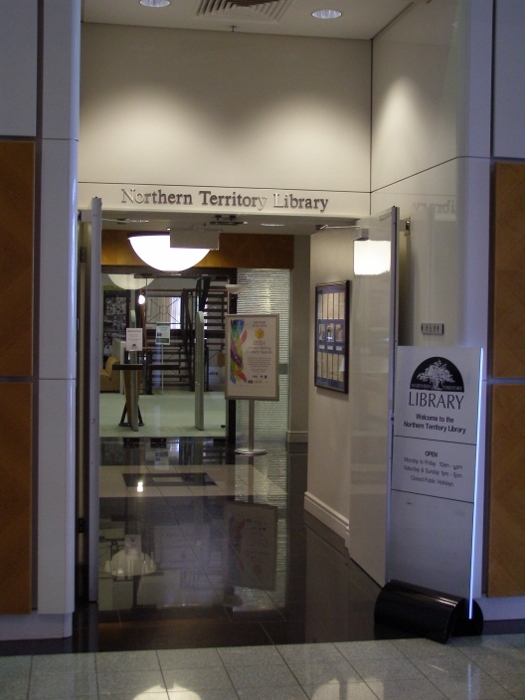 Before I take my flight to Perth, I had some time to find some literature about Numbulwar from the Northern Territory Library, which proved to be an excellent source of information. Many books that I have found are even harder to find in other parts of Australia, let alone in Europe. One of the librarians referred me to the extremely practical website “Trove” from the National Library of Australia which compiles photos, newspaper articles, maps, journals and audio-visual material that can be found, and often can be consulted online. Coincidentally, I noticed that there was a small exhibition about Paul Foelsche (1831-1914), the police officer who became famous for his photographs of Darwin and Aboriginal people from the area. We at the Museum of Ethnology have a small collection of photographs by Paul Foelsche. Today I was to give an account and feedback of my research. Both the social sciences and the humanities were invited to my seminar. How do you summarize a month’s worth of rich and valuable investigation into an hour? It was a friendly group of researchers and teachers who had a lot of questions about both the research on John Tunney pictures, collections in Leiden and the process of sharing the Alex van der Leeden pictures in Numbulwar. A very nice end to my very enriching research trip in Australia! Many thanks to everyone who made this research trip possible! My journey to Numbulwar begins today. The community was founded in 1952 by the Church Missionary Society, and has mainly been settled by the Nunggubuyu people. By 1964, just about all Nunggubuyu lived in Rose River Mission, as the place was then called. This name was later changed to Numbulwar. During the Dry Season (starting around the month of May), I could have reached the settlement on land via a 10-hour trip from Darwin. For this trip however, I was required to fly into the community. My first flight went from Darwin to Groote Island via Vincent Aviation. The plane was almost completely full with its 16 passengers. Then there was a charter flight booked by Katherine Aviation. They serve the small settlements that are often hundreds of kilometers apart. 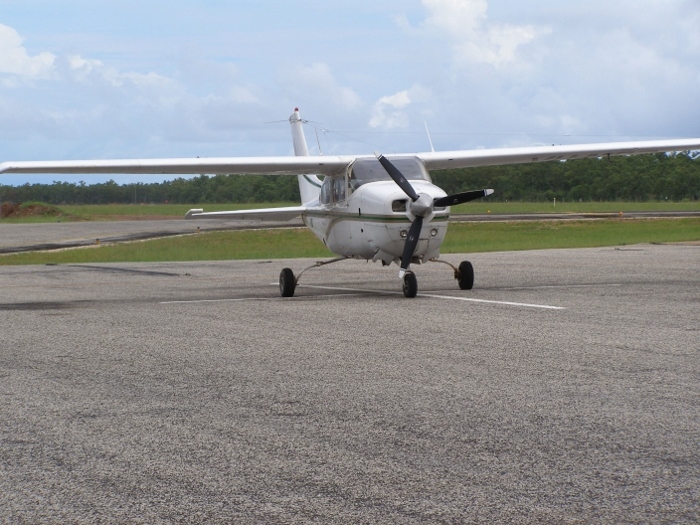 The pilot of a small single-engine plane took me down a short flight of 25 minutes safely in Numbulwar Airport. After a while I was picked up by Ella Geia the ‘media’ assistant at the Roper Gulf Regional Council. I met the other office workers, visited the school and the ‘training center’ where I will stay for the next week. It is completely renovated and equipped with kitchen, bathroom, living room and dining room. 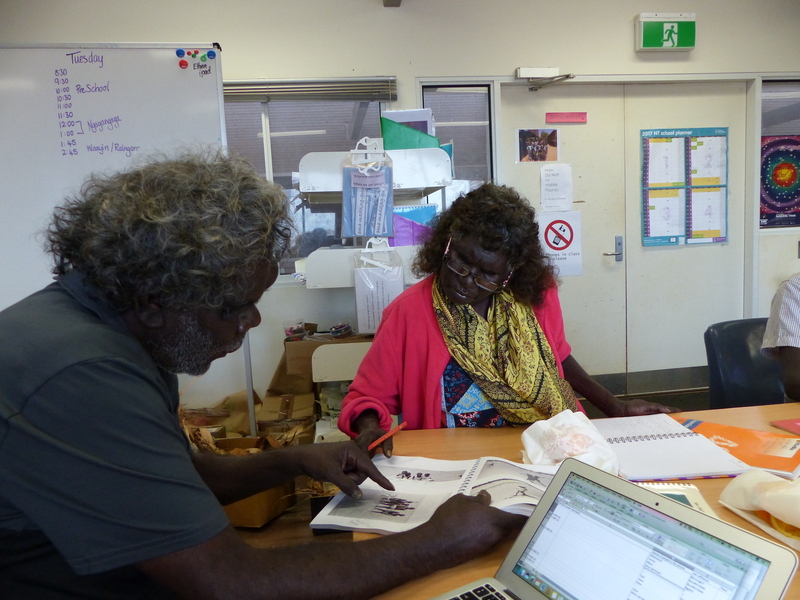 The women Faye Manggura , Ella Geia and Jangu Nundhirribala – drawing the project , a first look at the photo’s. Starting today a number of local women and I prepare the ‘exhibition’. Jangu (pronounced: Djangoe) Nundhirribala is the most enthusiastic of all and works tirelessly. She tells me stories and names of people appearing in the Alex van der Leeden photos. The women have also ensured me that the old men will view the photographs first to see which photos are suitable for the general public. Around 9am, two men came into the schoolroom where we worked. Their names are Ernest Numamudidi and Laalbid (John) Nunggargalu and they take four albums to the side to look through. Laalbid found a photo of himself as a young boy (a ongetrouwde man) with Alex van der Leeden. He said that he went everywhere “with that old man” and that he worked for the researcher as a young boy. After a while, Ernest tells me each photo that needs to be labeled ‘restricted’ that cannot be seen by the women in the community. We agree that these images will be labeled as ‘men’s only’. Although this process did not seem too difficult, it soon became apparent just how serious the community is about what can be considered appropriate for public viewing and what is viewed as ‘men’s only’ pictures. Later when some pictures are shown via a projector some women want to leave the room feeling that they should not be looking at those images. Even though the male elders did not restrict these images, I removed these images out of respect for the women anyway. A little later the women assured me not to worry about the fact that I had seen those pictures because I was not in the culture. The photographs may not touch me. Laalbud Nunggargalu sees himself in a photo. 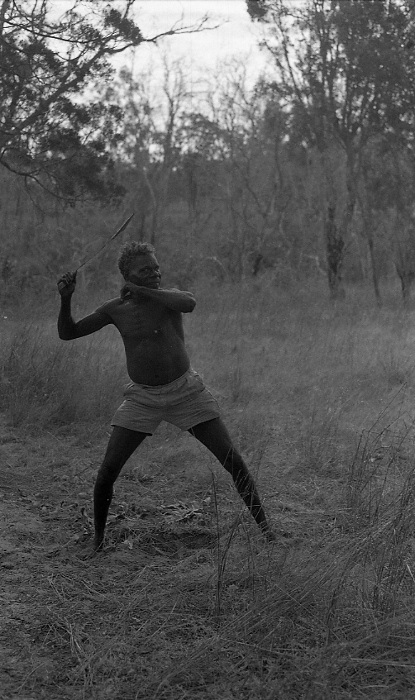 A much younger Laalbid Nunggarfalu photographed on May 30, 1964 at the Amayadiruid campground. The ‘van der Leeden exhibition” will open today. People in the settlement waited impatiently the opening. They wanted to see if there were images of their families or themselves. Together with a number of women we have set up the exhibition in the language classroom of the local school. 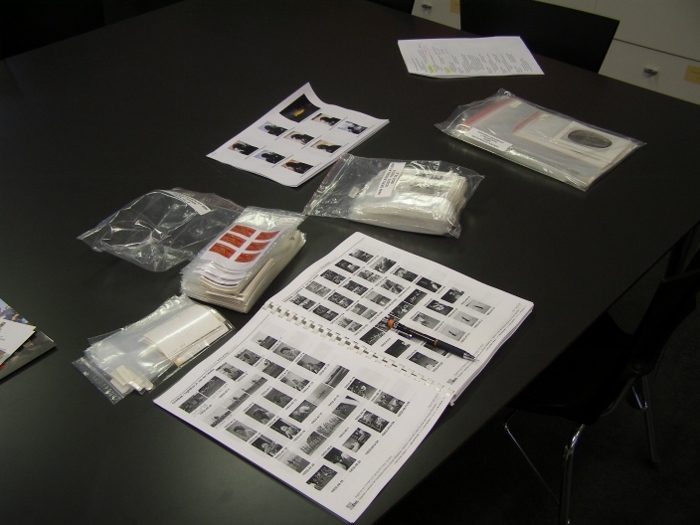 People are able to view printed images through a selection of plastic wallets that are hung on a wall of the room. Also a projector had been set up to project photographs that were not restricted and could be viewed by woman and children and available to all. We have placed the ‘restricted’ photos in albums (that had been marked clearly) in a secluded area that were only available to men. The men took this opportunity to view these images at length. It’s great to see all these happy faces. Suddenly Leonie Murungun exclaimed on seeing a picture of her aunt: “I can not stop looking at this picture”. Her statement depicts the overall atmosphere of the exhibition. The visitors often stay longer than an hour because there is so much to see in the displayed pictures, photo albums and the whole slideshow. Some visitors came even two or three times. In the beginning it was mainly women, but as the day progressed, there were more and more men. Leonie Murungun exclaims, “I can not stop looking at this picture”. Today the exhibition continues to attract local residents. The local school brings the school children to look at the exhibition. Jangu Nundhirribala again works tirelessly explaining to the children how everyone is related, and how important it is to understand these relationships. Jangu talked to the children the entire time in Wubuy, the local language. Occasionally she comes up with an English phrase like “You’ve got to understand the relation,” which again underlines its importance. When the children become tired and a little distracted, they call them to order and reiterate just how important these photos are. They belong to their history. Kinship in Numbulwar and the Nunggubuy in general is very complex. There are relatives and classificatory kin. For example, a person’s mother or father can have that role without being their biological parents. 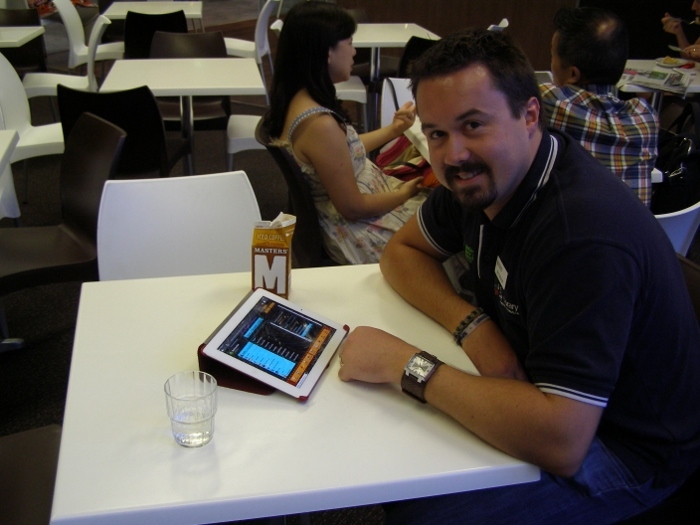 During his research, Alex van der Leeden was investigating the entire system. There are six clans and six clans of mixed origin. In addition, the population is divided into two halves moieties or population. Each clan has their own rituals, their own sacred places and totems. Jangu Nundhirribala discuss the photographs to the school children. It’s nine o’clock in the morning and we have already been asked if the exhibition open today. Shortly afterwards, two men entered who viewed the photographs quite extensively. They laugh a lot upon finding photographs of themselves or other family members. Many stories were told, mostly in Wubuy. The photos bring positive memories, a stories of a time where there were no boats and where the boys and men had built all the houses themselves; a time where the children and their parents only had just made the transition from a nomadic to a sedentary existence. People could not get enough of it. One man told me he had been yesterday, but he came once again because it was so good to see all those memories. The fact that these pictures were visible on their computer is also reassuring for the residents of Numbulwar. Even if I’m gone, they can still look at the pictures. Except for the girls who work in the local supermarket, everyone is free on weekends. Today we planned to reap pandanus with the women, but it turned out to be too wet. So much so that it rained for eight hours making the roads all soggy. 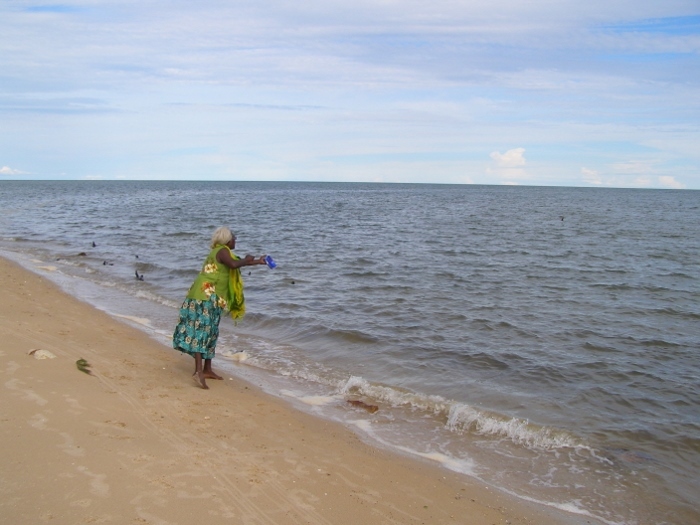 Later in the day Jangu decided to take a walk to catch crabs that we could use as bait when fishing. The walk follows the coastline at the rising tide. Jangu shows me different places that are also seen in the pictures of Alex van der Leeden. She tells me that we cannot swim in the sea because of the sharks and also have to watch out for crocodiles. We are lucky with the weather and listening to her stories is very enjoyable. Upon our return to my residence, we organize to meet up with other locals to go fishing after lunch. Then Jangu informs me that she now considers me her Ngaragaagu, (her grandmother). We both find it funny that I’ve become the grandmother of someone who is twice as old as me. I now belong to the Nunggargalu clan. We have little luck at fishing and come without anything back home. I will always remember this day, as the day I became a ‘grandmother’! 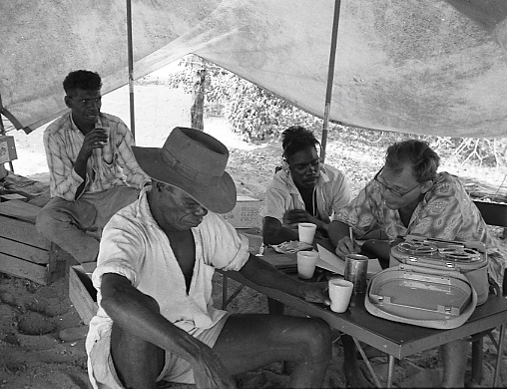 During his research in Arnhem Land and more specifically in Numbulwar (1964-1965), Alex van der Leeden gathered a total of 75 objects. Unlike his photo collection, his object collection is exceptionally well documented. 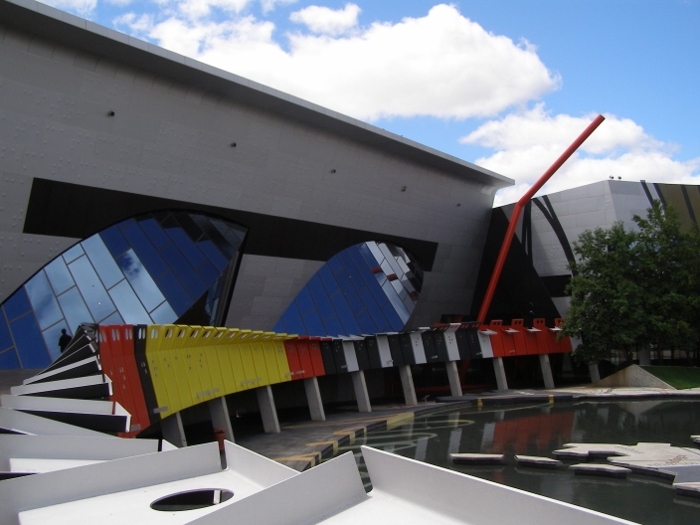 The collection is in three museums: the Australian Museum in Sydney, the National Museum of Australia in Canberra and National Museum of Ethnology in Leiden. 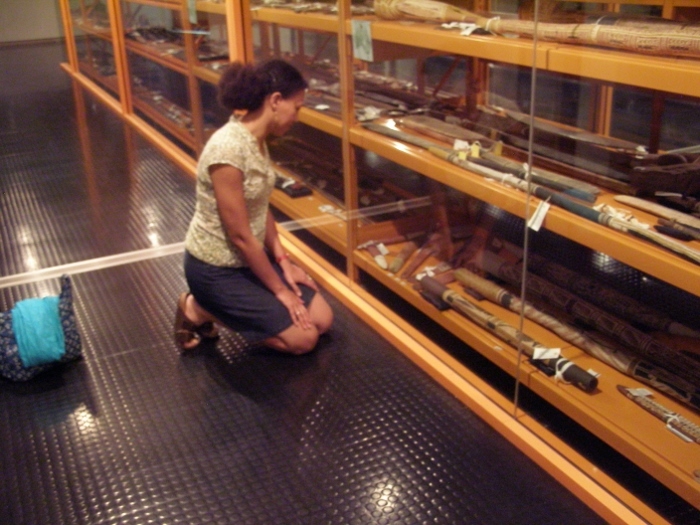 The objects that are located in the National Museum of Australia can be viewed in an open depot. Visitors come to view the multiplicity and diversity of these objects several times a day. The Alex van der Leeden collection has tree bark paintings, carrying nets, baskets, bracelets and spears. 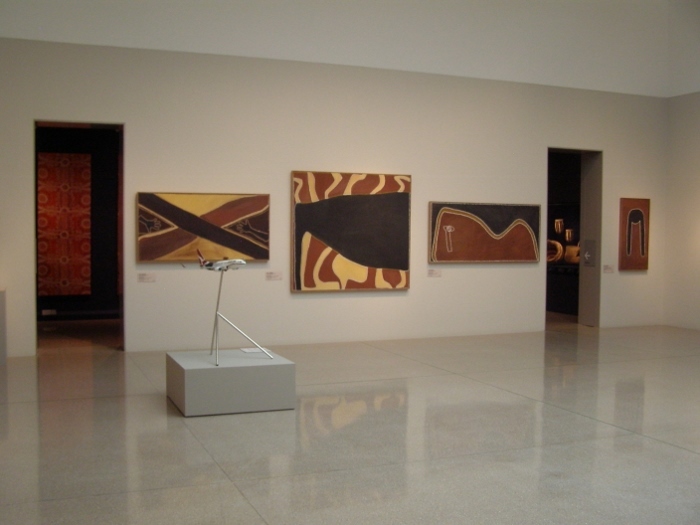 The bark paintings are among the most visually striking objects. 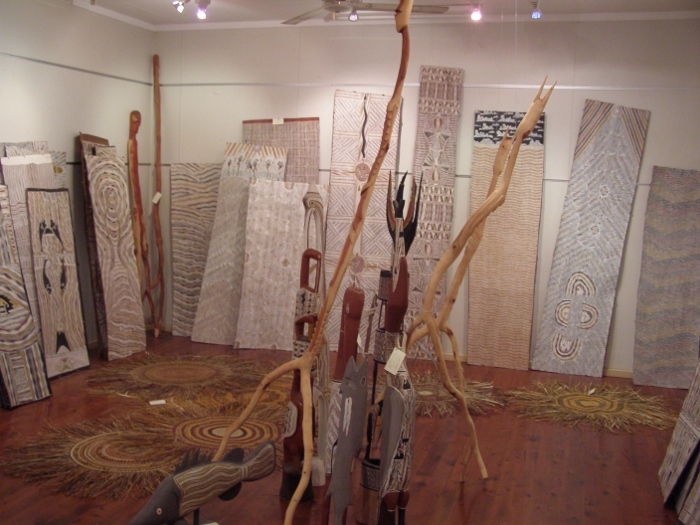 Moreover, they are exceptional because bark paintings made this way generally came from the north coast of Arnhem Land and not the east coast. An example is the painting of an emu made by Minju’gak in January 1965. 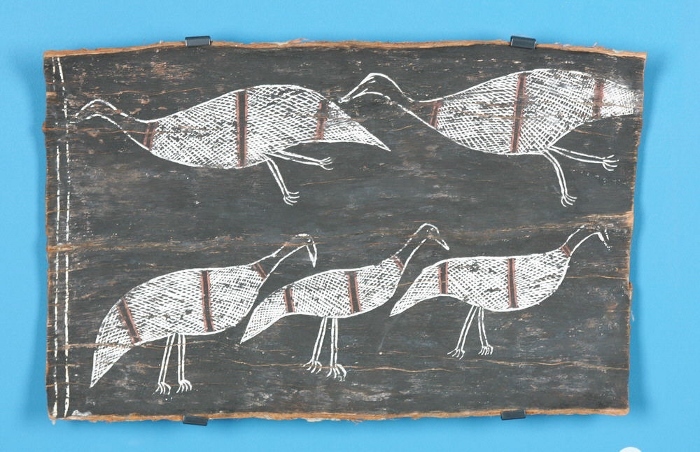 The two rows represent emus from two different stories. 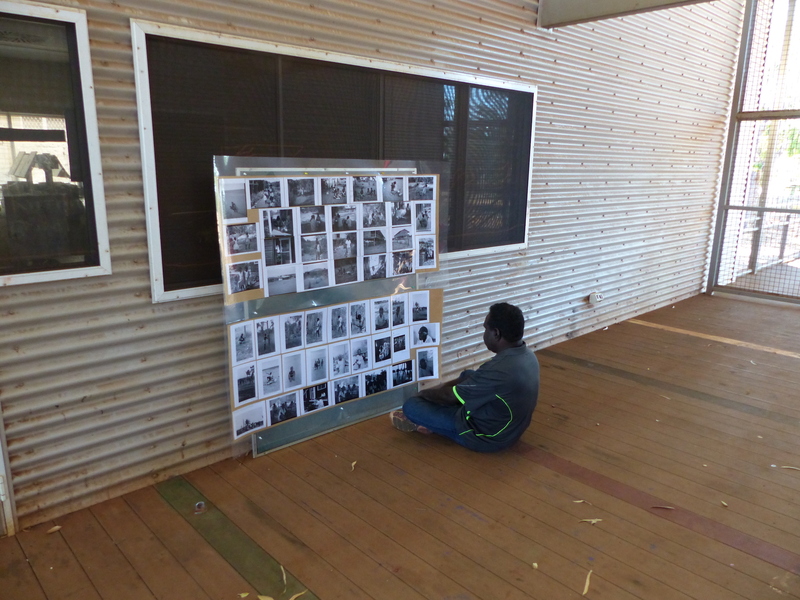 After going through the archives at AIATSIS of Alexander Cornelis van der Leeden works, I get a better picture of the man and his research. 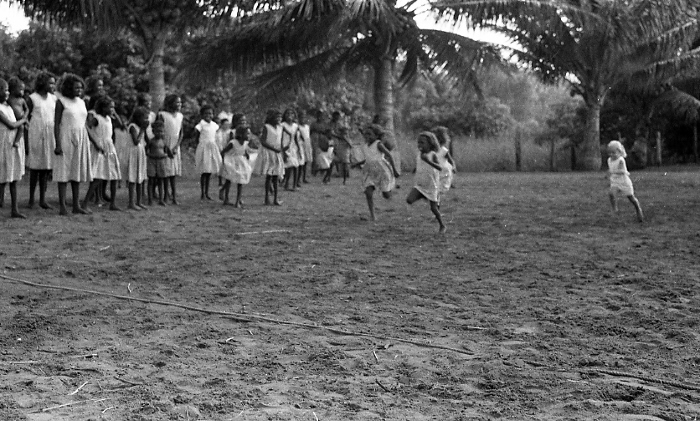 For his thesis, AC van der Leeden conducted fieldwork in Sarmi on the north coast of New Guinea from 1952 to 1955. During that period he was employed by the Office of Population Affairs in was known as Hollandia, the current Jayapura. His work was characterized by the structuralism of Claude Lévi-Strauss. He graduated in 1956 with a thesis entitled, “Main Draw of the social structure in the western interior of Sarmi”. Shortly after, Van der Leeden became the Assistant Curator of the Indonesian branch of the Museum of Ethnology in Rotterdam until 1960. From 1960 to 1969 he was appointed the Curator of the Indonesian branch of the National Museum of Ethnology in Leiden. It was during his work in Leiden that he received a grant from the Dutch Organization for the promotion of Pure Research (ZWO) and the Australian Institute of Aboriginal Studies (AIAS) to conduct research in Numbulwar. His report shows that he was very well prepared. 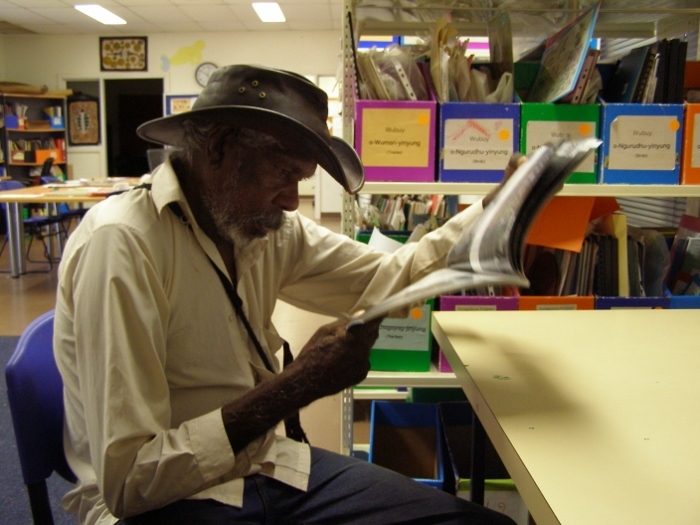 He had talks with all major linguists, anthropologists and ethnomusicologists from Perth, Sydney, Canberra and Darwin who had previously worked with Aboriginal groups. 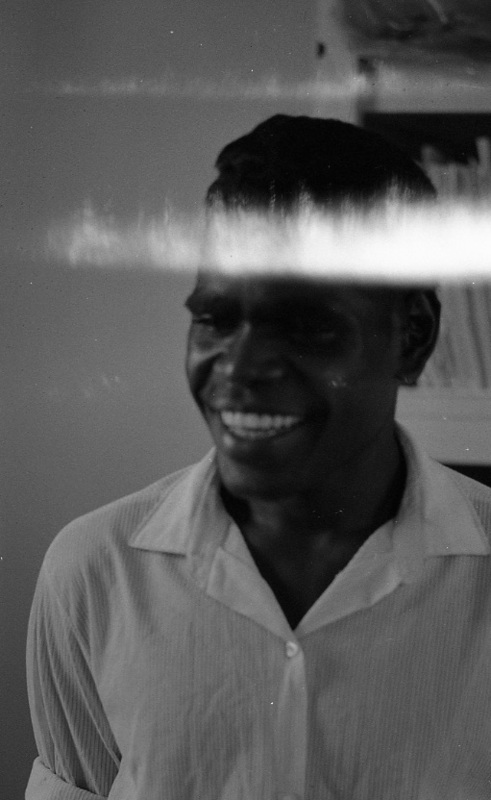 With the research funds he received from AIATSIS, he was able to buy a camera with enough film supplies as well borrow their audio equipment for recording. In his reports, he states that the arrival of his wife and youngest daughter to Numbulwar not only made his stay more enjoyable, but it made it much easier to communicate with the local Numbulwar women. Cards are fascinating documents. The exhibition “Mapping Our World: Terra Incognita to Australia ” which is on display in the National Library in Canberra shows the development of cartography since the first modest attempts in antiquity to the most advanced achievements of contemporary times. The stories that are linked to it, are extremely fascinating! The exhibition begins with how the original inhabitants, the Australian Aborigines, the scenery and the routes described in the stories of the Dreaming, also shape on the plane. I read in the introduction to the catalogue of the exhibition that most Australians believe that Captain Cook’s discovery of Australia in 1770 was unprecedented and any previous encounters by others was past over in the history books. However, the exhibition also reports that the first documented contact to the Australian shores was in fact 160 years before Cook by Willem Janszoon aboard the Duyfken. The fourth section of the exhibition is actually dedicated to the Dutch Golden Age and the Dutch East India Company: stunning travel maps and atlases ornate witnesses of this period. The landing of the Duyfken in 1606 is presented on a map of Hessel Gerritsz, while a Bonaparte Card and Huydecoper diary represent Tasman’s voyage. Although the exhibition, at first glance was unrelated to my current project of researching Alex van der Leeden’s work, it did reveal a long history of research and contact between the Netherlands and Australia. After a journey of seven hours with two flights, I arrived around noon from Canberra to Darwin, the northernmost capital of Australia. 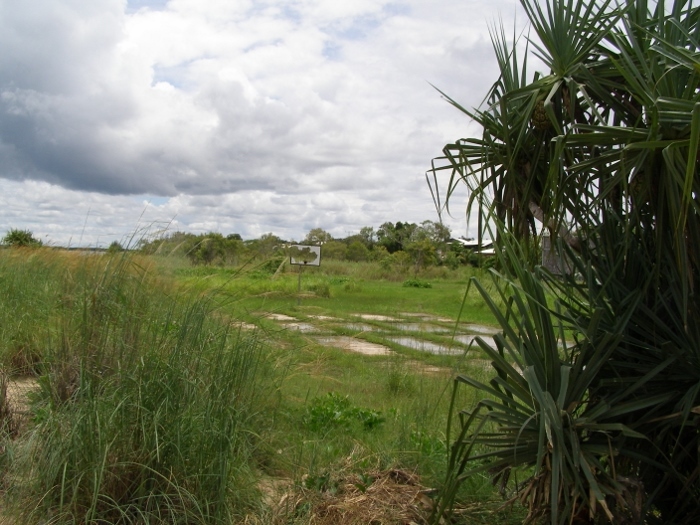 On the way to the city center you will see small termite mounds everywhere. Remarkably, there are no mosquitoes in the subtropical climate at this time. 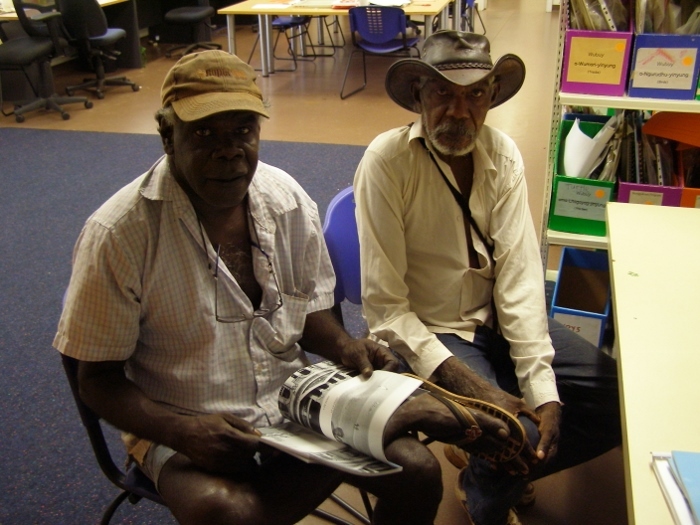 I had an appointment with Mick and Dida Main Uibo a little life outside Darwin. Dida Main was born in Numbulwar and the conversation with her gave me a taste of the stories that I will get to hear in Numbulwar. Unlike many anthropologists in the Netherlands, Dida knew very well just who “Dr. van der Leeden was. He had come with his wife and his daughter Anne Lise and she remembered as a little girl always being silent when Dr. van der Leeden was making sound recordings. Dida Main knew the names of just about every person in the pictures. As it turned out, Mick and Dida Main’s daughter teaches at the high school in Numbulwar, and was able to inform everyone of my arrival. I wonder how people will react to the pictures and objects? The first settlement was called Palmerston in 1869, which was renamed Darwin in 1911. The city has few historic buildings and has in fact been entirely rebuilt twice: the first time after the Japanese air raid on February 19, 1942 and the second time after the Hurricane Tracy almost completely destroyed the city in 1974. Everyone I speak to wonders whether the new high-rise buildings (up to 40 floors high) will withstand the hurricanes that hit Darwin during the rainy season. Due to its geographical location in the north of Australia is the city’s gateway to Indonesia and East Timor. 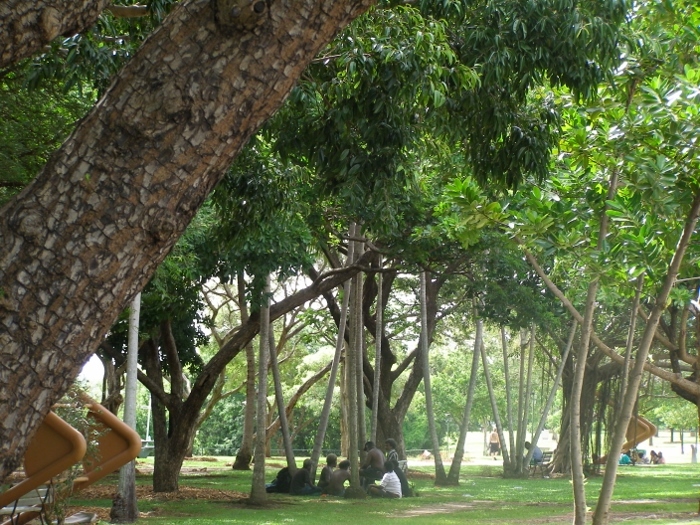 More than in other Australian cities there are also many Aboriginal people sitting in the shade of the banyan tree or the gum trees. 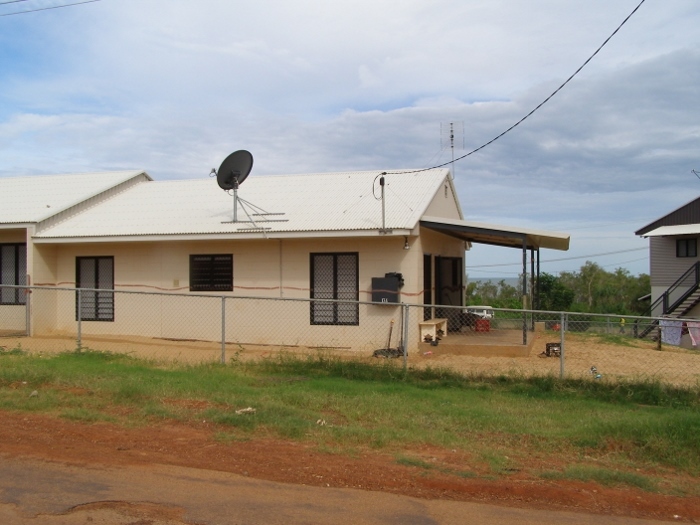 Darwin was built on country traditionally belonging to the Larrakia people. The Museum of Ethnology preserves in its collections a total of 470 photographs taken by Alex van der Leeden during his fieldwork in Numbulwar from January 29, 1964 until January 29, 1965. It turned out that Professor Victoria Burbank from The University of Western Australia had worked with the Numbulwar community in 1977. When I arrived at UWA a meeting was arranged for me to meet with Victoria. This was a fantastic interview where she was incredibly generous with her information, and gave me a lot of tips and names of people I could contact the ground. 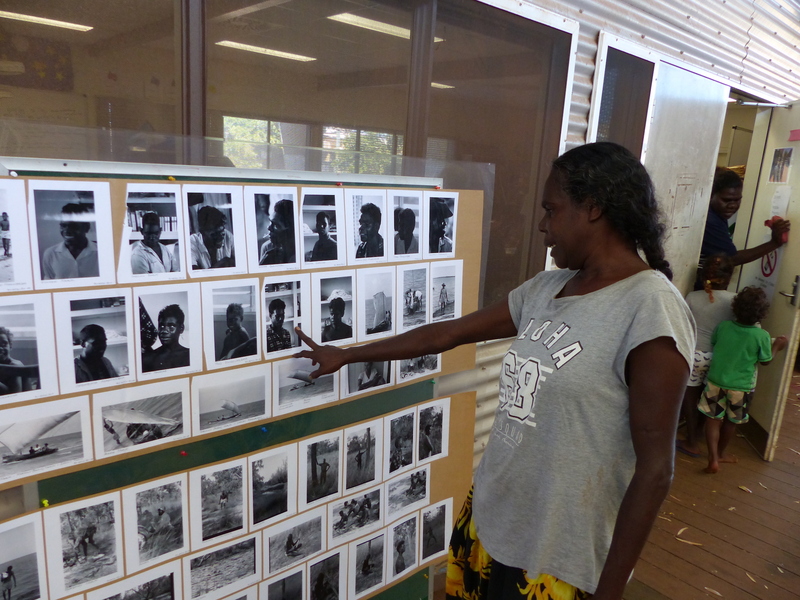 Although Burbank’s research was focused more so on the situation of women in the Arnhem Land communities – she thought it would be very valuable sharing our photo collection to the entire community. Professor Burbank certainly helped me to prepare for my trip to Arnhem Land. During our meeting, she could confirm for example, that attitudes to show pictures of deceased relatives to Aboriginal people no longer had the same concerns today as they might have in decades past. In fact in 2007, members of the Numbulwar community were shown pictures of a relative that had passed only two months prior and were received without problems. Before I flew out to Canberra from Perth, I decided to visit the port city of Fremantle. The historic town is half an hour from Perth and dates back to 1829. The village style atmosphere is in contrast to Perth a houses a large number of historic buildings and quaint shops. 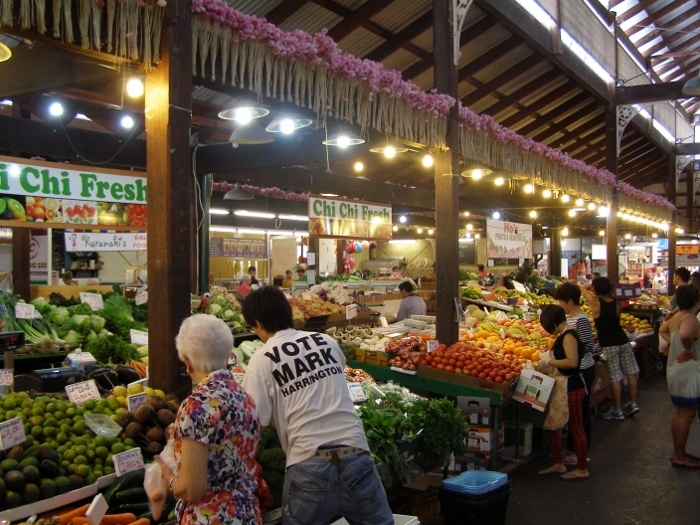 Whilst there I visited the historic Fremantle Market that offers a wide selection of jewelry, leather, honey, bread, fruit and other foods and went to Fremantle Oval, the home of the Bulldogs, the Australian football team which consists of eighteen members. I was even able to visit a fortune teller at City Hall and for the cost of $60 was told of my possible future. Also towering above the city skyline sits Fremantle Prison. 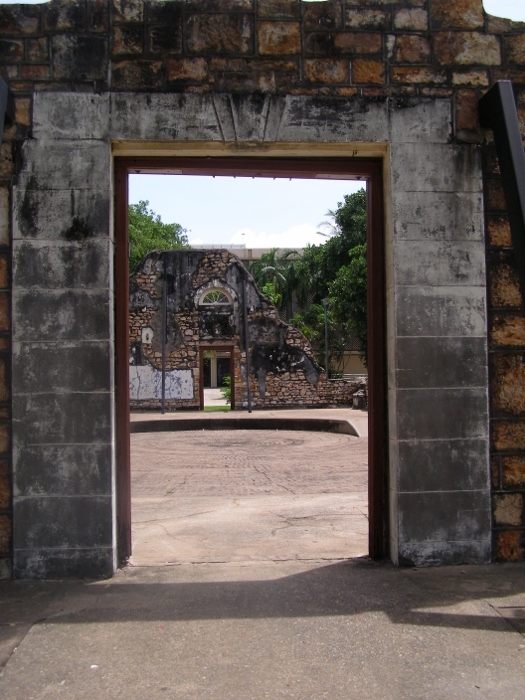 It is famous not only for its history as a prison from 1850 to 1991, but received a UNESCO World Heritage status from 2010. Canberra, the Federal Capital of Australia, is the home of the Australian Parliament and all national institutions such as the Australian National University (ANU), the National Art Gallery of Australia, the National Library, the National Museum of Australia, and so on. The American architect Walter Burley Griffin designed the city with a tight geometric plan in the early twentieth century. Canberra is not really a city for pedestrians. 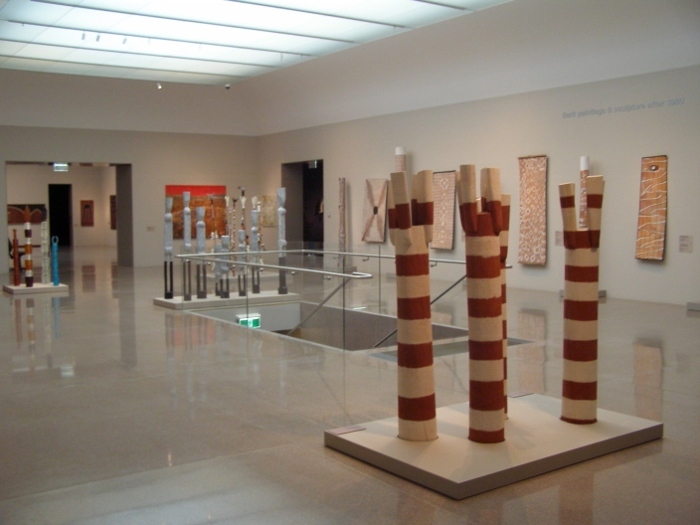 Nevertheless, I went to the National Gallery of Australia where there is a beautiful Aboriginal and Torres Strait Islander Wing and is furnished with pieces from their contemporary art collection, apparently the largest in the world. One of the highlights is The Aboriginal Memorial created by the Arnhem Land artists from the Northern Territory. On Monday I had a meeting with the Australian Institute of Aboriginal and Torres Strait Island Studies (AIATSIS). 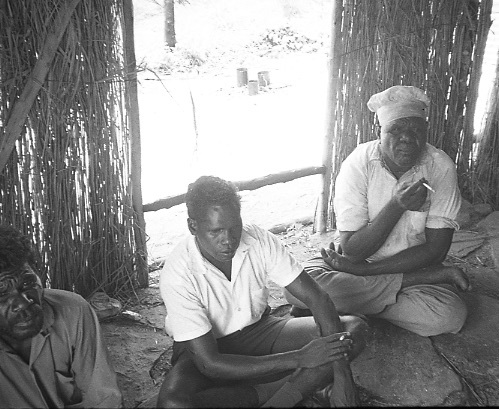 As mentioned earlier, the Dutch anthropologist Alex van der Leeden had a collection of 470 black and white photos, as well as 75 objects and made several recordings during his fieldwork in 1964-65 in the Numbulwar community, Arnhem Land. 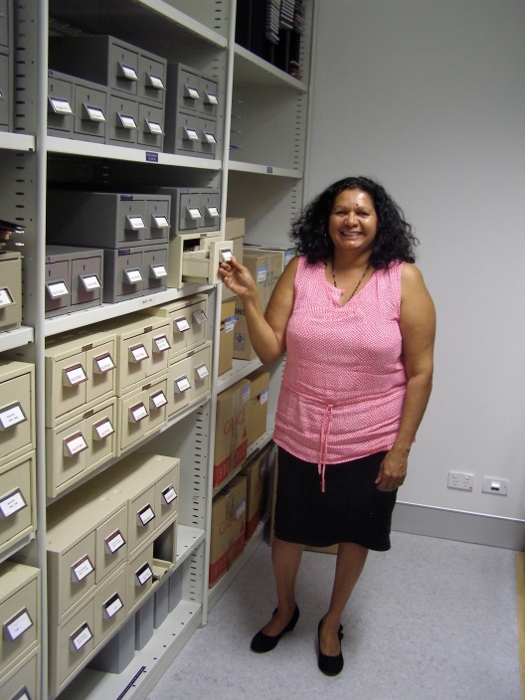 I wanted to compare our photo collection with the collection housed within AIATSIS. The Australian photo collection was not as detailed in their information as our collections were, but I did make some interesting discoveries. Some photos I could not view. 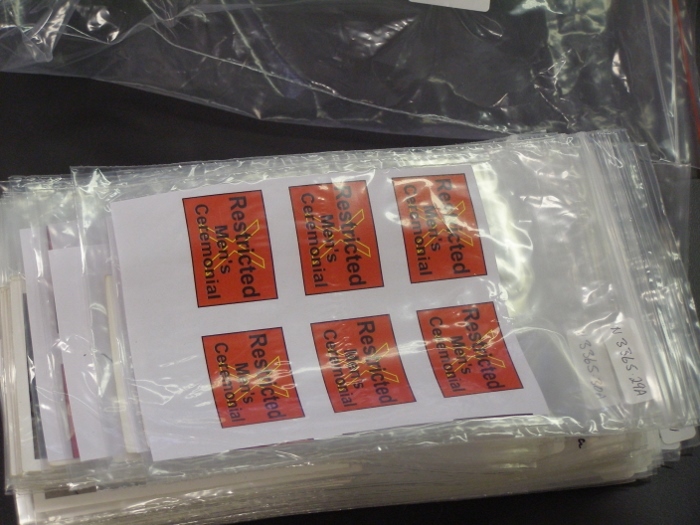 They were covered by a paper, which was labeled “restricted men’s ceremonial” (restricted, men ceremony). As I had similar photos that I had brought from our collection, I knew that I had to deal carefully with some of the images that may be considered to be ‘restricted’ material. Today, it is very common in Aboriginal communities that when dealing with images and information pertaining to secret / sacred ceremonies or objects special permission must be sought from the relevant knowledge holders or communities to get access. Now I know that I must deal will gently with a dozen photos when I have to ask you also to share with other members of the settlement of these pictures the permission of an elder “(an older man) numbulwar am and probably first. Perth, on the campus of the University of Western Australia starting my research trip. The University was founded by John Winthrop Hackett in 1911 as the first “free university” of the British Commonwealth who wanted to offer equal opportunities to all social classes. 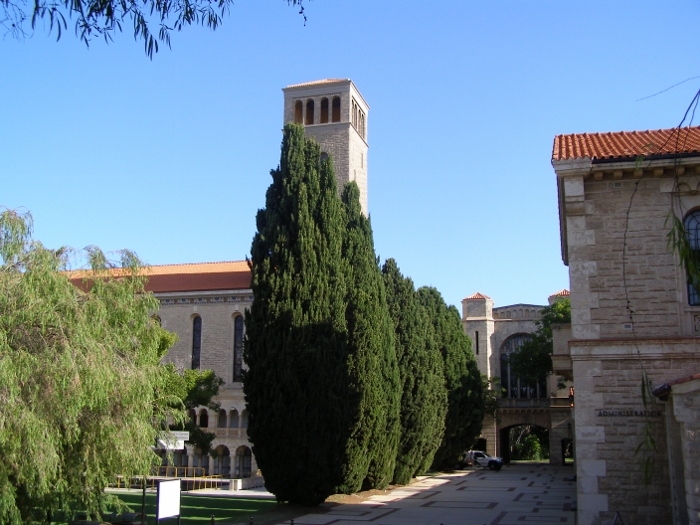 It is high summer in Perth, and the temperature runs constantly around 30°C and by early afternoon a fresh sea breeze is blowing. 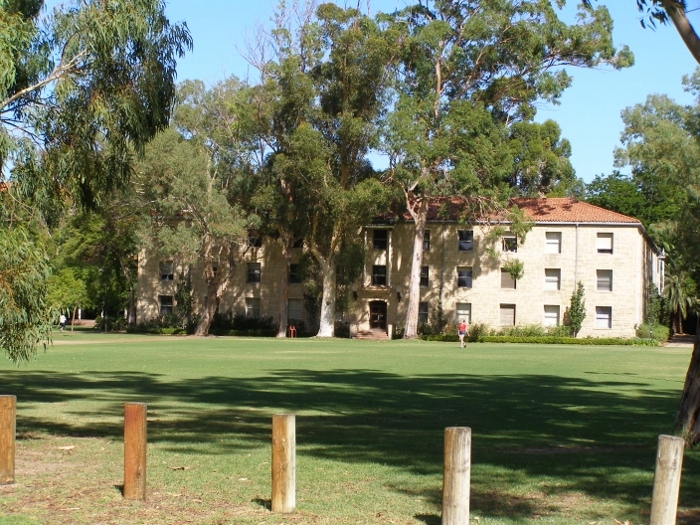 Although the campus caters to thousands of students, the grounds are also inhabited by a large population of galah’s (an Australian cockatoo) – they look like parrots but are grey with a pink breasts – and peacocks including a large number of male peacocks with their long, feathery tails. The peacocks will greet you at your office window every now and then! Together with Professor Jane Lydon, the project leader of the Australian Research Council study, we prepared for my trip from Perth to Canberra and eventually onto Arnhem Land. 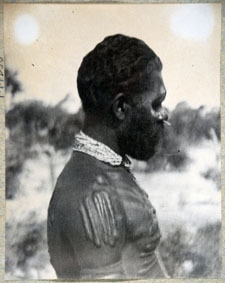 My month will be mostly dedicated to finding additional research on a group of photos that were taken in Western Australia at the end of the nineteenth century, and then to research and share a collection of 470 photographs that were taken fifty years ago by the Dutch anthropologist Alex van der Leeden in Numbulwar, a settlement in Arnhem Land. 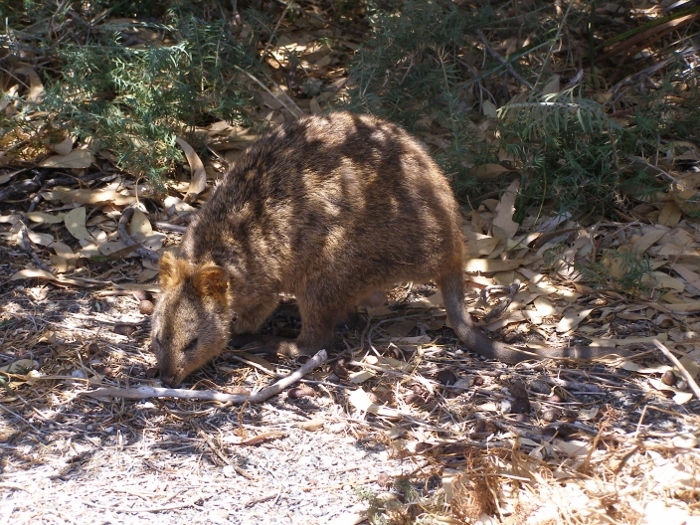 Rottnest Island got its name from the Dutch navigator Willem de Vlamingh because he thought that the many nests of the marsupials, known quokkas (Setonix brachyurus), which he found in 1696 on the island, were rats. So, “Rottenest” eventually became “Rottnest”. 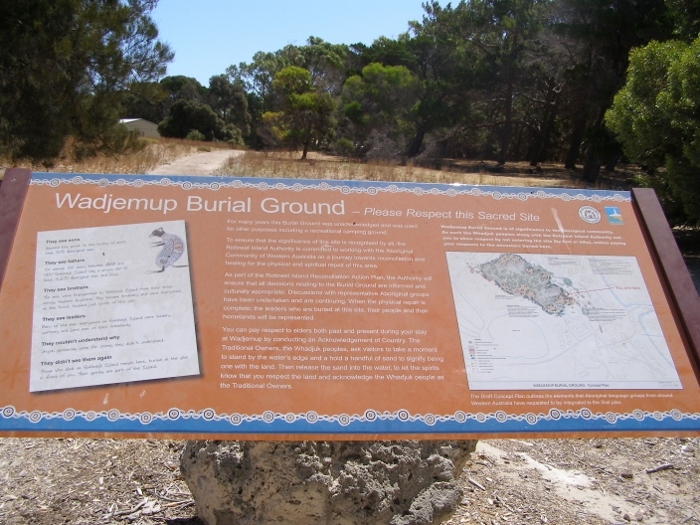 The aboriginal name Wadjemup is almost never used, although the site is closely linked to the recent colonial Aboriginal history. Around 6,500 years ago, people lived on the island before it was closed off from the mainland by the rising sea levels. The Island still plays an important role for the Noongar Aboriginal communities as a place where spirits dwell. A painful chapter came in 1838 when the first 10 Aboriginal men were sent as prisoners to the island. In 1931, the prison closed its doors. Sadly during that period 369 Aboriginal men, mostly leaders and bearers of cultural knowledge lost their lives. Nowadays hundreds of tourists visit the island daily, enjoying the beautiful scenery and accommodations for holidaymakers. Although the Noongar Cirlcle of Elders and the Rottnest Island Deaths Group Aboriginal Corporation continue to make sure that the public is educated on the Aboriginal history of Rottnest and that tourists are well aware of sacred places within the landscape. 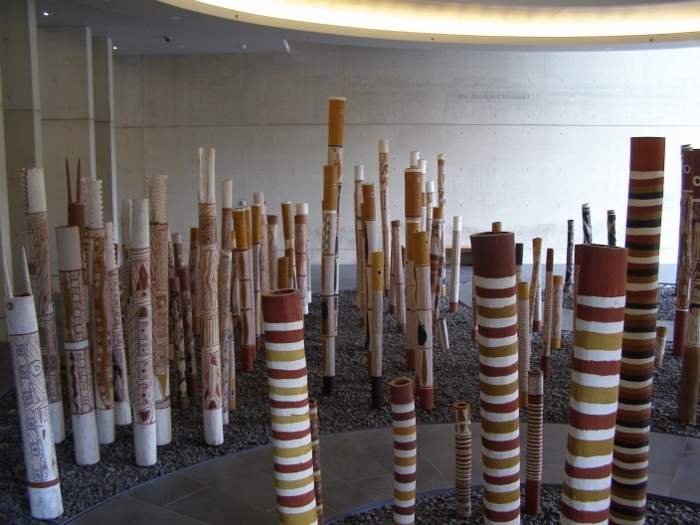 The Berndt Museum of Anthropology was named after its founders Ronald and Catherine Berndt, in 1976, and is actually a University Museum where a wealth of Aboriginal art and artifact collections is kept. I was particularly interested in their small collection from Melanesia, particularly Papua New Guinea. I had an appointment with Ted Snell, the Director of the Cultural Precinct, which includes all university museums and Barbara Bynder, Deputy Director and Curator of the Berndt Museum. 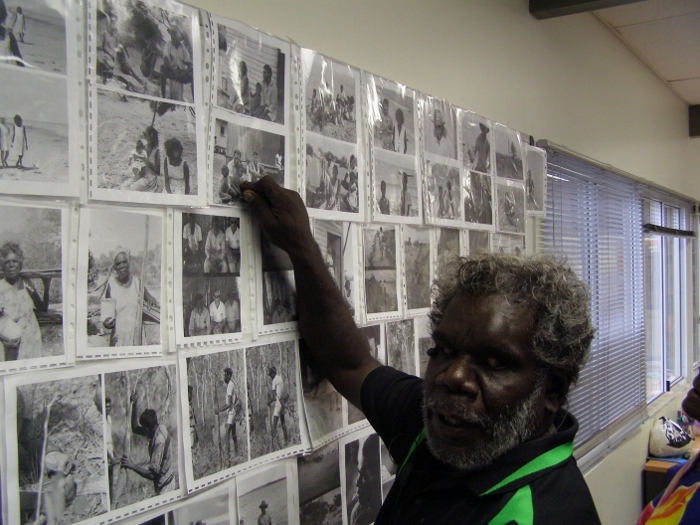 During this meeting I came to know a lot about how Aboriginal communities deal with photographs. Barbara Bynder, a Noongar woman told me that many older people are a lot more cautious than some younger Noongar people when it comes to what pictures can and cannot be seen by the general public. In general, the Museum works with the different communities and allows them access to the various collections that has beneficial outcomes for both the museum and communities involved. 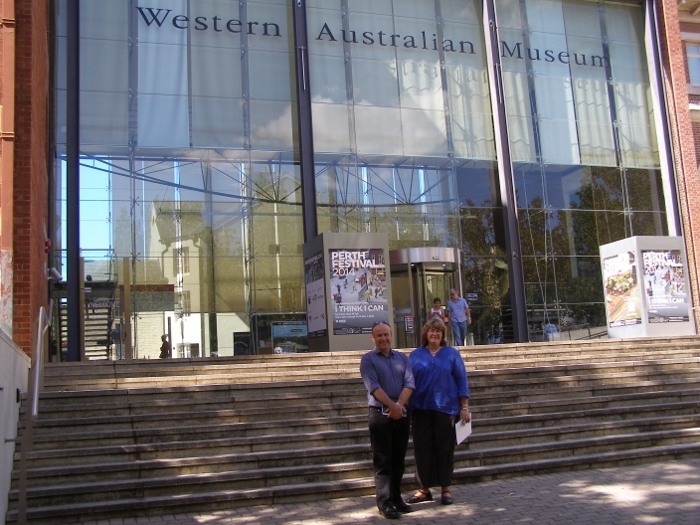 In the Western Australian Museum, Dr. Moya Smith, Head of Department of Anthropology and Archeology and Mr. Ross Chadwick, the Curator in the Department of Anthropology and Archeology greeted me. The museum houses both skeletons of wildlife and humans. The setting up of the Aboriginal Australia arrangement has been held up for more than four years. With every photo and every object Aboriginal owners were contacted to obtain the necessary permissions. Moya and Ross, I also discussed a set of photographs that I had found in Paris, at the Musée du Quai Branly, which was sent at the beginning of the twentieth century by the Western Australian Museum in the former Musée de l’Homme. I suspected that the pictures were taken by the Australian collector John Thomas Tunney (1870-1929) who was appointed in 1895 as the museum collector. His task was to build natural history and ethnographic collections for the growing Western Australian Museum. When Tunney received a camera in 1898 from his museum director Bernard Woodward, he did not know how to use it. Luckily he got lessons during one of his collecting expeditions. He limited his photos to portraits of people in Coolgardie, Carnarvon, Broome Beagle Bay, Murchison, Yalgoo, Nullagine, Northam, Ashburton River, Derby and Bunbury to the front and back view and profile shots. I was happy to hear that my suspicions were confirmed. The photos were indeed taken by John Thomas Tunney. Moreover, both Moya and Ross were not aware that any of Tunney’s prints had ever left Austrralia and were now in Cambridge and Paris. This study lifts a corner of the veil on the extensive networks that existed between museums around the world where objects and photos were exchanged and the turn of the nineteenth century. Damien Webb and John Geijsman have been working on a great project that focused solely on the Aboriginal photographic and some audio collections housed in the State Library of Western Australia. 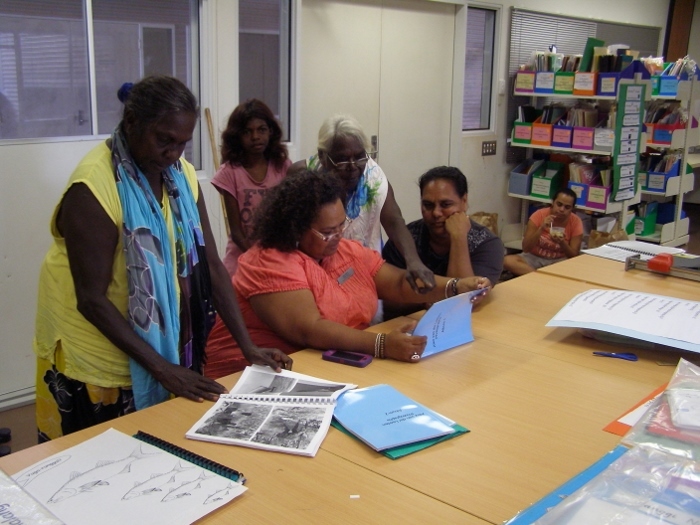 The project is called “Storylines” and the system allows Aboriginal people’s from all over Western Australia to find family names, places of significance and view recorded footage and photographic archives of family and community members. The programme is highly interactive and intuitive and is continually being updated to provide more information for its users.